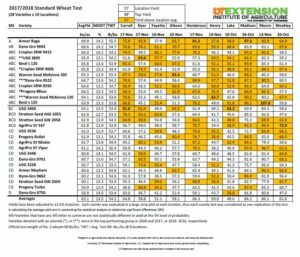 2018 County Standardized Trials (CST) wheat harvest data are now available. Our county trial yields were consistent with yields in much of the state, down around 15 bu from what we had last year. Late planting due to excess moisture and a cool, wet spring with delayed fertilizer and insecticide applications, didn’t get this crop set up for record year.